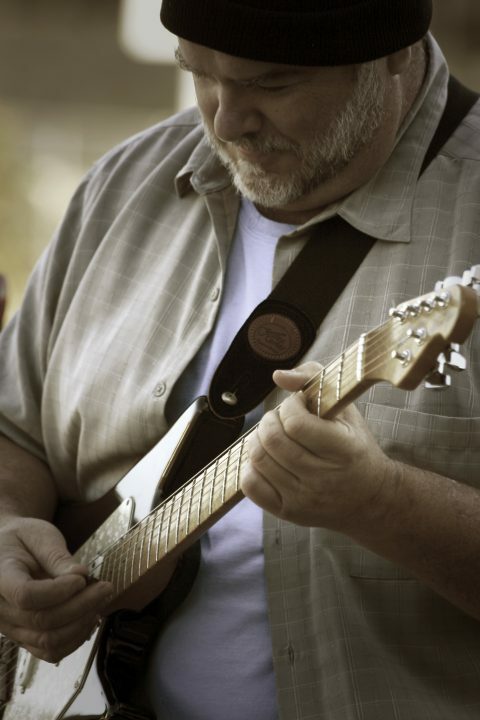 I play electric guitar, acoustic guitar, electric bass and acoustic "upright" bass. I can play keyboard parts into a sequencer, but I don't play enough to call myself a keyboard player. It's functional keyboard playing. Just don't ever watch. I've done a fair share of playing live, but I live for the studio. Not just being able to fix mistakes, but all the tools and techniques open up so many possibilities. Thanks to one of my mentors, I got into the studio for the first time at age 14 - King Studios on Brewster in Cincinnati, where James Brown made his records - and all the lights went on. I knew that's what I wanted to do for a career. 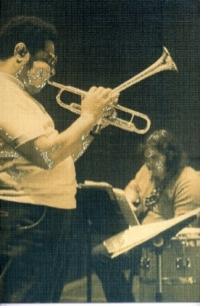 Dizzy Gillespie and me - 1971. I played guitar in the University of Cincinnati CCM jazz lab band, and Diz was our guest artist that year. Sometimes the guitar parts were chord symbols, but sometimes they had bebop lines in unison with the horns. The way I'm staring at the chart, this one is probably one of those. 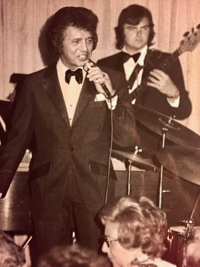 In 1974 I went on the road with Buddy Greco. Buddy mostly sang but he was a good piano player - he had played with Benny Goodman. Sometimes we worked as a trio but most of the time we had a big band - 4 trumpets, 4 trombones, and 5 saxes. In 2001 Chris Guest was looking for a bass player to back up Mitch and Mickey - played by Eugene Levy and Catherine O'Hara - for his movie "A Mighty Wind." He auditioned some guys at USC and the age gap wasn't working. Also he asked my friend CJ Vanston if he knew of a guy who looked like he used to back up M&M but in the intervening years had put on some weight and lost some hair and CJ said "Have I got the guy for you!" We made the movie, then we went on tour, then we capped it off by playing the Mitch & Mickey song on the 2004 Academy Awards show. I fell into the jingle business. I knew Ron McCroby in Cincinnati. He appeared on the Tonight Show as a whistler, but his day job was to write music for ads. I played on some of his sessions. The players were all top notch, I was in the studio, playing, overdubbing, trying this and that. One day it was comic cartoon music, another day it was the blues, then funk, then rock, then something else. The clients were smart. The bread was good. I moved to Chicago and met Jerry Lilidahl who had just started his own shop. Jerry hired me. Jerry liked to work at Paragon - owned by Marty Feldman - and Marty’s second engineer was Ed Cherney. So Marty and Jerry would sit at the 16 channel Flickinger board while Ed and I sat behind them. Good times. When I fell into the jingle business in 1973 I didn’t imagine staying in it for 30 years. But the clients were smart, the players were top notch, every gig was a new creative challenge, I was in the best studios and the bread was good.